Chickens naturally peck and squabble, but there are a number of methods you can use to help minimize distress, fighting and injury among birds in your coop and outdoors. When there is bullying in a flock, you can put some obstacles around to help out chickens that are getting picked on too much. These give the chickens something to hide in back of, jump onto and run around while evading attacks from other chickens. Sacks of feed, buckets, additional perches, trash cans, etc. can be useful.Window frames (with either glass or wire in the middle) leaned against things can also be excellent for a flee-er to run behind and be protected yet be able to keep track of aggressor's travels. Window frames are even better if you can nail them so they are stand vertically and are at 90 degree angle to the wall. Then a fleeing chicken can also have the option to jump up and perch on the top edge to escape, and pursuer can't immediately chase her if she jumps down on the opposite side. Lower-ranking chickens also appreciate shadowy, cluttered areas where they can hang out and not be noticed as much. It helps to put food & water in some of these areas so less-dominant chickens still get plenty to eat and drink. You can put "chicken saddles" or "hen aprons" on hens who get bald, bare or bleeding backs from over-enthusiastic rooster breeding. Even a hen that has been fearfully hiding out may happily rejoin the flock after you put a saddle on her and she realizes the protection it offers. You can sew a saddle yourself or order one online for around $12. Tip: If the saddle is the kind with elastic straps that go beneath the wings, the elastic may chafe on the front of the wing just above the "wingpit". To increase comfort, splice in a bit of smooth satin ribbon (like is sold in small rolls at fabric stores) to replace some of the elastic there--but do leave the rear portion of the strap as elastic so the saddle will stay on well. You can lessen the potential for hurt or injury by trimming chickens toenails with normal "people" toenail clippers, and then smoothing them a little with a nail file. You can also use the nail file to round off the point on a sharp beak. Only trim the ends where there is not sensitivity--going too deep on nails or beaks can be painful and cause bleeding. Visit our page on trimming or blunting roosters' spurs and toenails to learn more about helping with rooster issues. Temporarily blunting spurs can be particularly helpful when introducing new roosters. 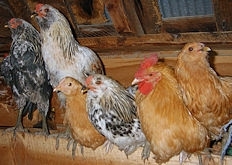 Before introducing a new chicken or reintroducing one that was separated more than a couple days, you can put one or two of the other chickens with the "outsider" for a few days right beforehand. Then the newcomer can hopefully develop friendship under less pressure and have at least one buddy, and there is more than one "newcomer" to dilute the flock's energies when you put them all together. If you are introducing some chickens into an established flock, it helps if the newcomers can get familiar with the new environment before having to interact with the "old-timers". Pen up your established birds somewhere else for a few hours and let the new birds explore their new home and learn escape routes before having to deal with unfamiliar birds. Put new birds in your coop after dark. Place them on the perch beside your existing birds. When they all wake up together the next morning, they will integrate with less fuss than if introduced suddenly during the day. If you have to temporarily separate one bird from the others, try to keep it where it & the others can see each other at least part of each day. If you separate chickens more than a couple days, it's almost like they're strangers to each other when you put them back together, and they have to re-establish relationships. If one of your chickens persistently bullies others, you can try removing it from the flock for 3 or so days. When you put it back, its former social status will have been largely erased, and the others will probably keep it at a lower, more "newcomer" rank.